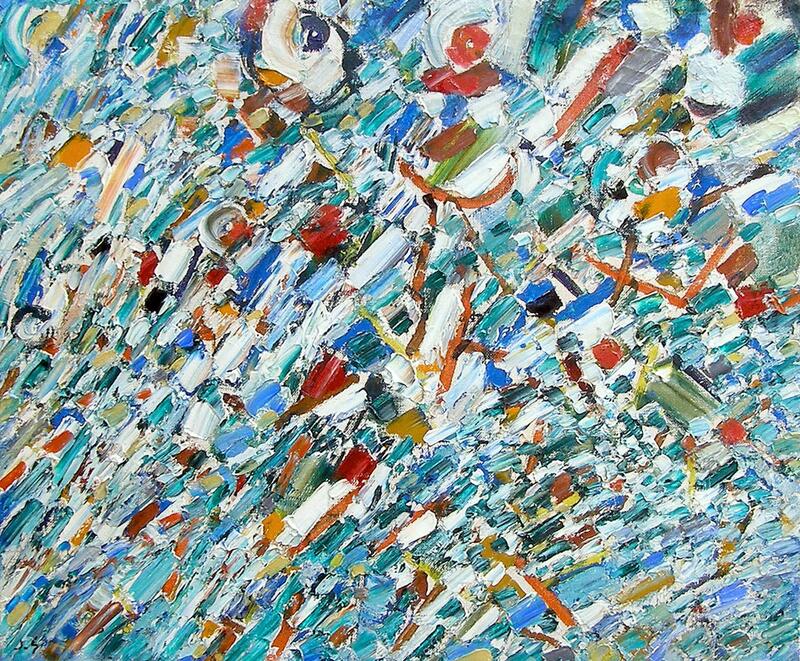 "The same French lyrical use of colour which found its great champion in Delaunay, has new exponents in Bazaine, Estève, Lombard and Germain" (M. Seuphor: A Dictionary of Abstract Painting, London, 1958). Jacques Germain achieved international status in the 1950's and featured in contemporary art exhibitions around the world until his recent death in 2001. In 1949 he started to exhibit at the Salon des Réalités Nouvelles, an annual Salon founded in 1946 dedicated solely to the display of abstract art. Germain also participated frequently in the famous yearly "École de Paris" shows at Galerie Charpentier alongside Atlan, Hartung, Soulages, Poliakoff, as well as in important group exhibitions both in France and abroad, most notably Le Mouvement dans l'art Contemporain (Musée de Lausanne, 1955), Exposition Internationale de l'Art Abstrait, to celebrate the publication of Michel Seuphor's seminal book on abstract art in 1957, Ecole de Paris (Mannheim, 1959), and the Irish International Exhibition of Modern Art (Dublin, 1962). He also held regular one man shows at the galleries Maeght, Pierre, Michel Warren, Kriegel, André Schoeller, Jacques Massol and Dina Vierny (for a comprehensive list of exhibitions please refer to the monograph Jacques Germain, Paris, 1990). "The poetry of Germain is dominated even in its smallest details, and above all through the steadfastness of his personal expression, by an interior movement in tune with the great rhythm of nature, not visually remarked and translated in a picturesque way, but intuitively perceived and manifested by a participating pictorial act. Germain's œuvre is among those, very rare still, in which the conceptualism of abstract art as well as the conventions of figurative art are overrun to find once more, in an uncontrived way, the profound meaning of nature" (R. van Gindertaël in Les Beaux-Arts, Brussels, 1959). The artist's work is represented in numerous important museums of modern art including the Musée National d'Art Moderne - Centre Georges Pompidou (Paris), Musée d'Art Moderne (Paris, Ville), and the city museums of Lille, Bremen, Bergen, Lausanne, and Oslo. 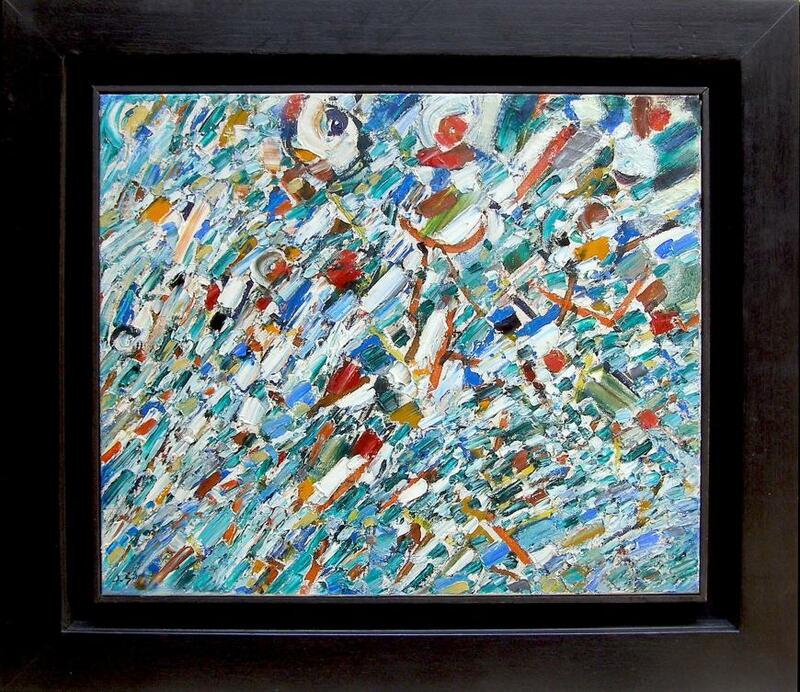 Jacques Germain's canvases from the 1960's which include Composition Abstraite, number 494, exude deliberate and rhythmic brush strokes that enliven and energize the picture plane. Germain claimed that abstraction came to him naturally. After World War II he departed from figurative work for this more avant - garde style. It was through this "lyricism" that Jacques Germain attempted to find and express the "profound meaning of nature". He believed that within the natural world a tune, or rhythm, existed and he wished to explore a means on the canvas to express this theory. As with nature, all is not chaos and it is the same with Germain's canvases. There is method to his way of constructing the work and a pattern that he creates and follows. The best of his works do have patterns, textures, rhythms and a physical sense of energy that radiates.